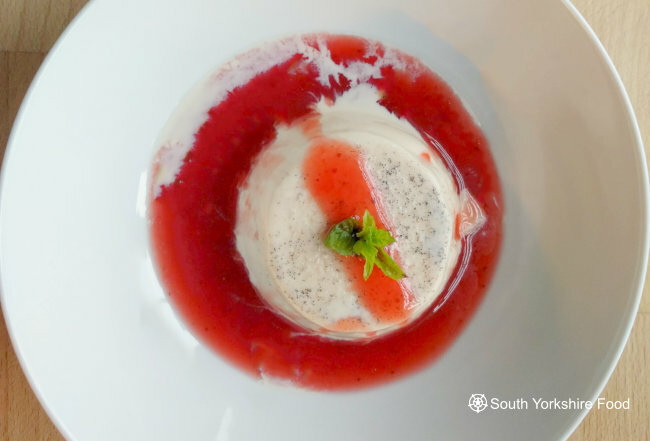 Panna cotta is an Italian dessert of sweetened cream thickened with gelatin and molded in a ramekin. It is utterly delicious, and very easy to make. For the panna cotta: Soak the gelatine leaves in a little cold water until soft. Place the milk, cream, vanilla paste, and sugar into a pan and bring to a simme, then take off the heat. For the sauce: Wash the strawberries, remove the stem from each one, and cut in half. Place the sugar, water, strawberries, and strawberry liqueur into a pan and bring to the boil. Reduce the heat and simmer until the sugar has dissolved, and the the strawberries are soft. Take the pan off the heat and leave to cool a little. Using a hand blender, blend the sauce until smooth. Pass the sauce through a sieve into a bowl. To serve, turn each panna cotta out onto a serving plate.Tip: place the ramekins in a tray of warm water for 30 seconds or so and this will ease removing the panna cotta. Spoon over the sauce and dust with icing sugar. Variation - Chocolate Panna cotta: Melt 125g of 70% dark chocolate in a heatproof bowl over a pan of simmering water. Take the melted chocolate off the heat and pour the cream and gelatine mixture into the chocolate, mix well and pour into the ramekins.